at Arlington National Cemetery in June. Chambers had lived in Monticello, Virginia, with her husband. Specialist 4 Linda M. Chambers, United States Army (retired) is remembered at the Women’s Memorial at Arlington National Cemetery in Arlington, Virginia. Her photo and information include – in her own words – her memorable experiences…My most memorable experience was working for the 1st Battalion 80TW FA, Aschaffenburg, FRG. I enjoyed knowing that I made a difference while working there. A military veteran and former Monticello resident has been given one of the country’s highest honors. 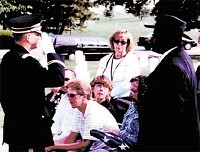 Specialsit Linda M. Chambers, who passed away on May 24, 2005, was buried in Arlington National Cemetery. Linda and her husband John, himself a Vietnam veteran, had settled in Monticello in late 2003 following a life in the military. She grew up in Michigan and was in the first group of female soldiers to take Basic Training at Fort Leonard Wood, Missouri. She graduated from basic training a day before her 35th birthday. She went on to Fort Meade, Maryland, for Cooking School, and then was assigned to the 1st Bn. 80th Field Artillery Bde in Germany as a cook. When her skills as a keypunch operator were discovered, she was transferred out of the mess hall and assigned to headquarters where she was eventually trained as a track commander. While a number of her assignments were classified, she was also sent to Korea for a short tour of duty, and assigned to Fort Benjamin Harrison as well as Fort Sill, Oklahoma, and Fort Riley, Kansas. Linda was honorably discharged and medically retired from the military so that gave her eligibility, John says. Linda had separated (retired) from the U.S. Army in 1984. The couple met in 2000 when John and Linda lived in the same apartment complex in Indianapolis. They married at John’s mother’s home in Mississippi in April 2003 and set off in a motor home to tour the country. “She loved traveling,” he says. Perhaps it was fate, for when their motor home broke down in late 2003 in Crawfordsville, the couple found a mobile home park owner who had a spot at Valley View Mobile Home Park in Monticello. There the couple decided to settle down and continue their life together. “No subject was sacred when we talked. She worked in the yard; loved flowers, did crafts and loved to bake – cinnamon rolls, fresh and homemade,” John muses. After 25 months of marriage, Linda passed away in her sleep on May 24 and her way was paved to Arlington. “I gave John Roscka a copy of her DD-214 (her discharge papers),” John states. Roscka made the first of what was to become several phone calls to Arlington National Cemetery where 30 burials a day are average. Linda was assigned a place in Section 69 and arrangements were finalized. “We left at 3:30 a.m. June 14 to take the casket on the 14 hour trip. When there, we were assisted by a local funeral home,” Roscka says. From where she is buried, you can see the Pentagon (where it was hit) and the Women’s Memorial, according to her husband.